Fonseca, A., Justino, M., Souza Jr., C. & Veríssimo, A. 2015. 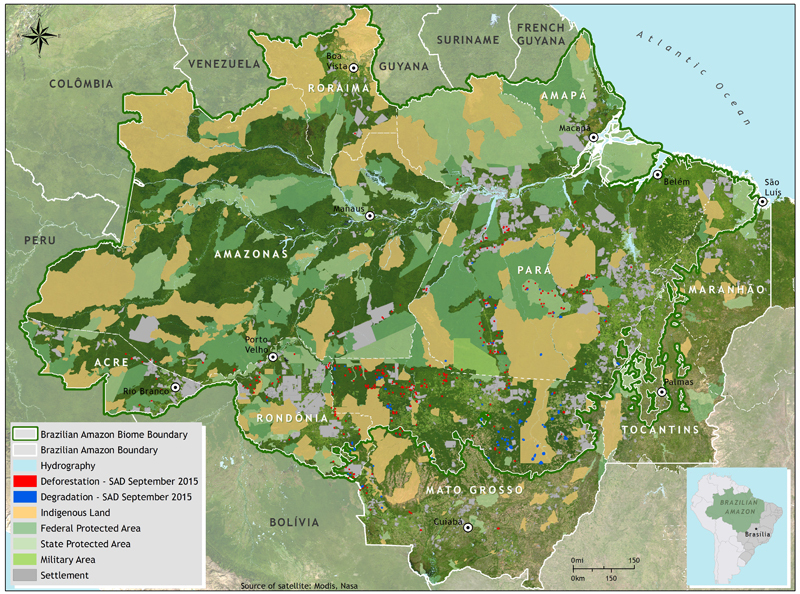 Deforestation report for the Brazilian Amazon (September 2015) SAD (p. 10). Belém: Imazon. 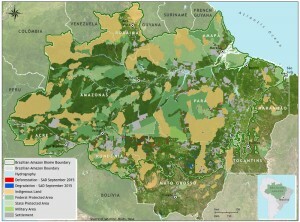 SAD detected 229 square kilometers of deforestation in the Brazilian Amazon in September 2015. That represented a 43% reduction in relation to September 2014 when deforestation totaled 402 square kilometers. It was possible to monitor 96% of the forest area in the Brazilian Amazon while in September 2014 monitoring covered a smaller area (93%) of the territory. In September 2015, deforestation was concentrated in Mato Grosso (55%), Pará (28%) and Rondônia (12%), with a lower occurrence in Amazonas (3%), Acre (1%) and Roraima (1%). Degraded forests in the Brazilian Amazon totaled 697 square kilometers in September 2015. In relation to September 2014, when forest degradation totaled 624 square kilometers, there was a 12% increase.